-Iron, scissors (both fabric and paper scissors), fabric marking tools, pencil, sewing machine….the usual sewing accoutrement. It helps to brainstorm ideas on regular white paper first. Simply cut out your sketches and then place them on the item you are affixing the appliqué to so you can decide where to place it and get a feel for the finished look without wasting fabric. Once you are happy with your idea, take your white paper pattern piece and place it right side down on top of the wrong side of the fabric. Trace around the pattern piece with water soluble ink, pencil or chalk (I’m personally a fan of these marking pencils). This will be your sewing line. Now, trace around the pattern piece again ¼” outside the sewing line. This will be your cut line. Repeat these steps on your fusible interfacing, but place your white paper pattern piece right side up on top of the wrong side of the interfacing (the right side of the interfacing for our purpose today is the sticky side which you should be able to discern by feeling the glue dots). Once your fabric and interfacing have been marked, cut out your appliqué shapes from both materials. Now take your interfacing piece and cut a slit or “X” shaped hole somewhere near the center. We will use this for turning later on and no one will be able to see it… so don’t worry if it isn’t pretty. If your piece is really long and narrow (like the road in my toy car travel pouch) forgo the “X” and just cut a slit (if you have room for an “X” it makes life easier, but some shapes don’t really allow for it). Place the interfacing and fabric pieces right sides together and sew around the entire shape using the stitch line as a guide (it will be a ¼” seam allowance, but I find sewing to the line is easier especially when I’m working with irregular shapes like my little lake here). You don’t need to leave an opening in your stitching, we are going to use our slit/ “X” shaped hole for that. I prefer to sew with the interfacing side up so I can see my dark graphite pencil sewing line better and my machine’s feed dogs seem to prefer I do it this way. Trim any pointy corners and notch any sharp indents (I always remember it as “trim the mountains and notch the valleys”) so your shape will lie flat after turning. Turn the appliqué right side out through the slit or “X” hole in the interfacing. Chopsticks are handy for making sure it is fully turned. Sometimes small items present a challenge in terms of getting the interfacing to lie flat and not stick out from behind the fabric. In these cases you can hand sew the slit or “X” hole closed with a few whipstitches to make it behave better for you. Finger press the appliqué in the desired location, making sure that the hole in the interfacing lies flat and doesn’t create any ripples or bumps on the front. When you are sure you like the placement, press it into place with an iron. To finish, all you need to do is stitch the appliqué onto the finished item. I use two distinct methods for this, depending on how much I need to hide the stitching. The first method (and the fastest) is to simply edge stitch with your machine around the edge of the appliqué with a 1/8” seam allowance. 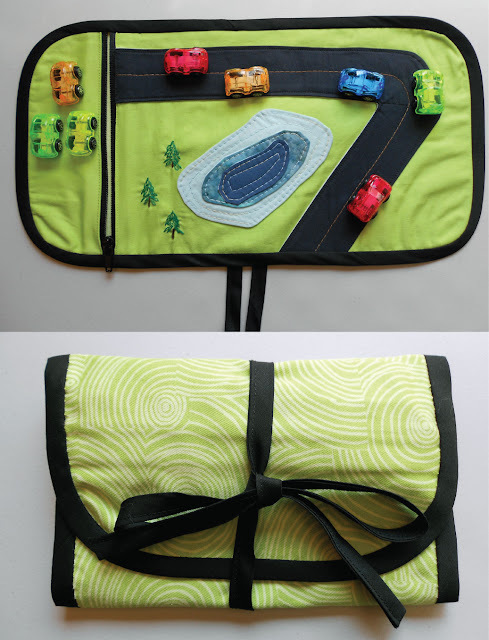 That’s what I did for my toy car travel pouch, since I constructed it in a way that would hide the bobbin stitches and I liked the look of the top stitching on the front. 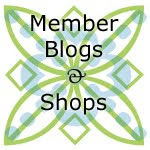 There are lots of possibilities for machine stitching. You can use matching thread or contrasting thread, depending on the look you are shooting for. If you have lots of embroidery capabilities on your machine, this is a good place to experiment with them. Some people also use invisible thread and the machine’s blind hem function so as to conceal the stitching on the front… machine blind hems have never been what you’d call my bag (just ask any of my Sewing 1 students) so if I want to conceal the stitches, I do it by hand. I use a stitch I like to think of as a hybrid ladder stitch/blind stitch. First, single thread your needle and knot one end. Insert the needle at your starting point on the wrong side of the background fabric and pull it to the right side very near to the edge of the appliqué piece- but without actually sewing through the appliqué piece. Now insert your needle into the edge of the appliqué piece right above the exit hole you just made and run the needle and thread along the inside of the turned edge of the appliqué for about ¼” before exiting and pulling the thread through. 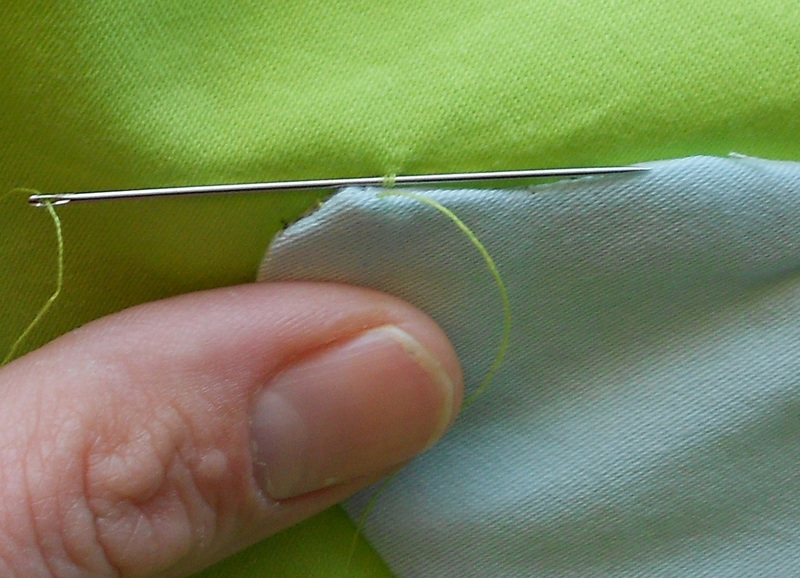 Place your needle through the background fabric right below the exit hole grabbing only a couple/three threads. Pull the thread through. Repeat the stitch until your appliqué is sewn around the entire perimeter. Knot the end of your thread on the wrong side of the piece. You can also hide the end knot (as well as the start knot) along the edge of the appliqué if you don’t want it to show on the wrong side of the project. And that’s it. I hope you enjoyed reading this post and that I inspired you to give appliqué a try if you aren’t already hooked on this technique. For those who are, please post comments telling us your tips and tricks…like any good recipe new twists keep it interesting. This is a great tutorial, Jen, thanks! What weight of fusible would you recommend? The only time I tried this technique before was with water soluble interfacing and it was kind of a disaster. I would love to try again using what you suggest. One thing I have tried is to make a pillow out of two pieces of the same fabric and stitch it down. It wastes a lot of fabric and then you can't fuse it (so it is harder to keep in place), but if you have really fiddly/detailed pieces it makes it a little easier to hide the white interfacing. Hi Kristin: Great suggestion on hiding the white interfacing, I wonder if you could use that method and then throw a piece of two sided interfacing on the back piece so you could fuse it in place... the interfacing shape may show through on the front- but maybe not... I'll have to try that for sure! As far as the weight, I use medium to light weight interfacing- whatever I happen to have around. You want it light so you don't get too much bulk, but not too light else it gets too ragged from the turning (and it is much easier to accidentally punch a hole along the edge when you are trying to turn it).